Sunday provided us with a perfect day to start the second month of Spring - what better way to celebrate than with a leisurely lunch. To help us along our way as we peruse the menu, a 1998 Yarrabank Cuvee Late Disgorged. It was disgorged in July 2006 - quite an elegant wine that even with 8 years on lees it remarkable didn't have an overly yeasty nose. Excellent persistent bead. For lunch you can choose from a limited choice set menu or the traderne menu - we opt for the traderne with two of the days specials. This dish could sit anywhere in a meal, start middle or end. 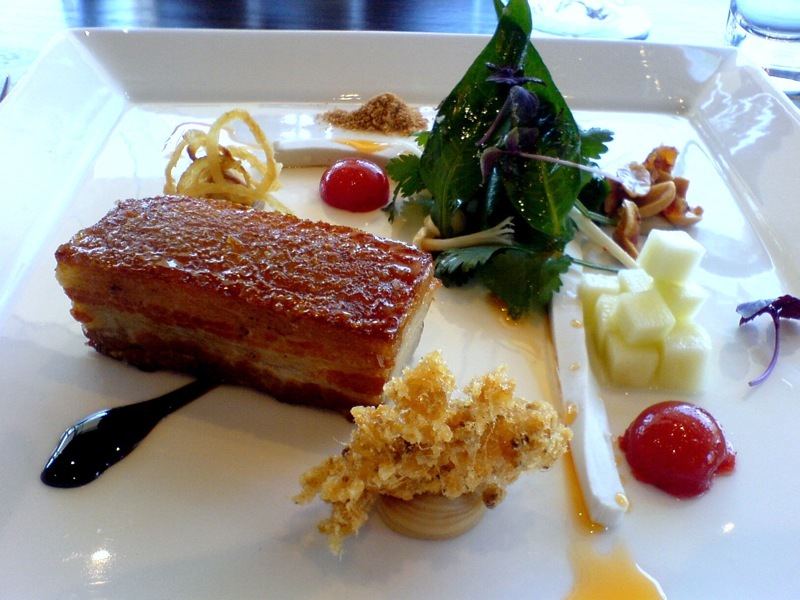 Stephen Downes rates the pork belly at Fenix as one of his "dishes to eat before you die". This is Raymond's 2006 incarnation of pork belly. This is a dish to impress - so many components, each matching perfectly to each other. This is a mathematicians delight as you work out the number of eating combinations that are possible. The long white element in the dish is a coconut noodle - formed by using agar agar, the noodle is a jelly. The two red domes are Nuoc Cham, traditional Vietnamese condiment. There's a salad of Asian herbs including Asian mint and coriander, also caramelised peanuts, fried shallots and crispy mulloway (these two elements sit on a thick laska sauce). It's deconstructed laska at it's best. 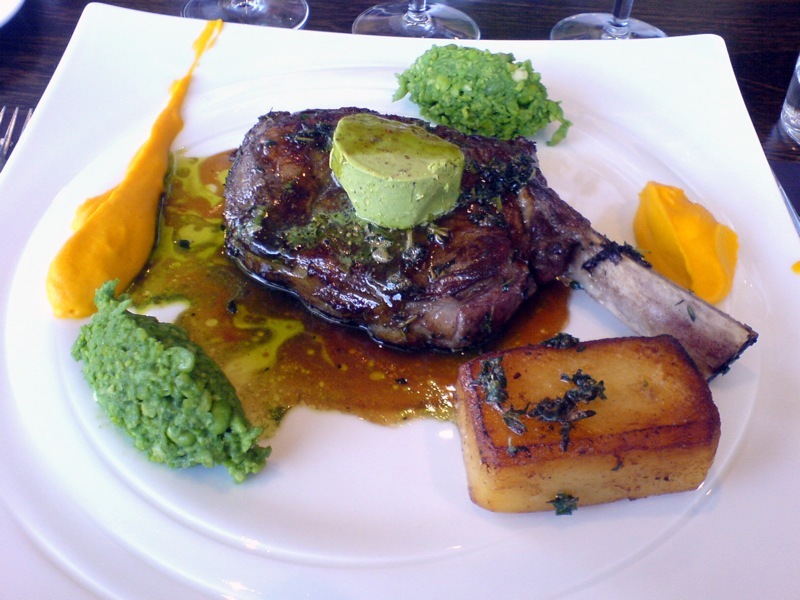 Beautiful pea tasting peas, Lovely lump of rib eye (cooked medium rare), great loaf of potato (slow cooked in butter), no word in any language to describe the best tasting carrot treatment ever eaten. The white asparagus sorbet might seem a bit odd but it works. The sorbet melting almost immediately as it hits your mouth leaving only the essence of asparagus behind. Nasturtiums provide a peppery bite to the dish. A deconstructed brulee? With additions. 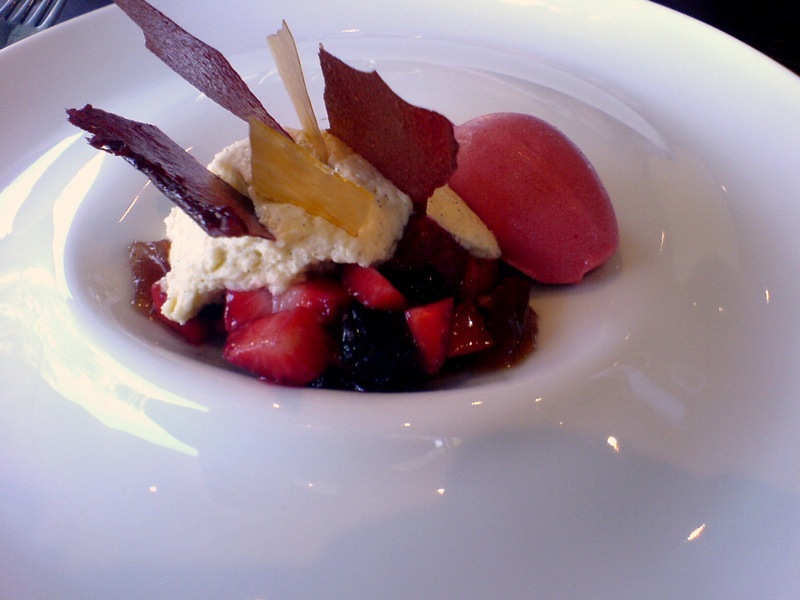 A really nice desert, refreshing fruit and sorbet. Separating the toffee from the cream is inspired as it enables the use of different flavours. The strawberry toffee was especially good. There is an element missing from this photo - a small glass of juice that's meant to be drunk once you are finished, it's a combination of lime and cucumber juice, most refreshing and cleansing. 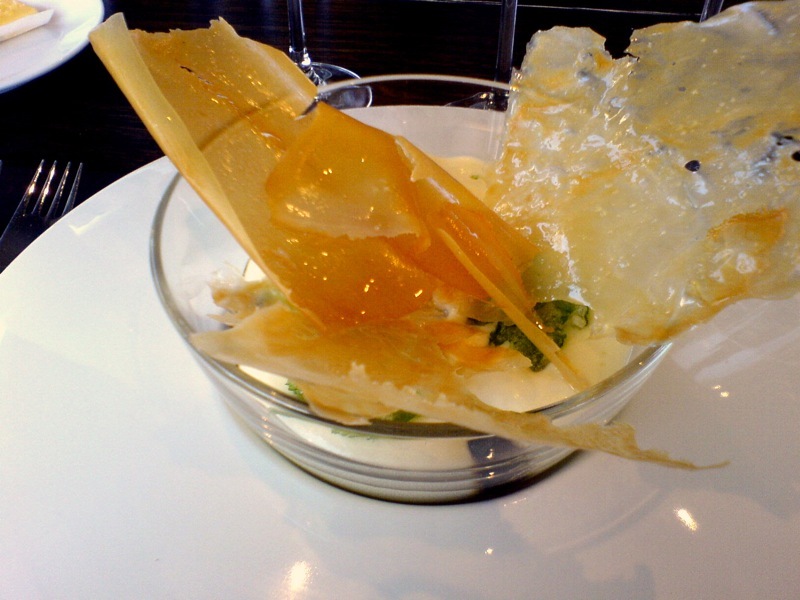 The vanilla mousse is presented as the speckled, white cord that runs the width of the dish. 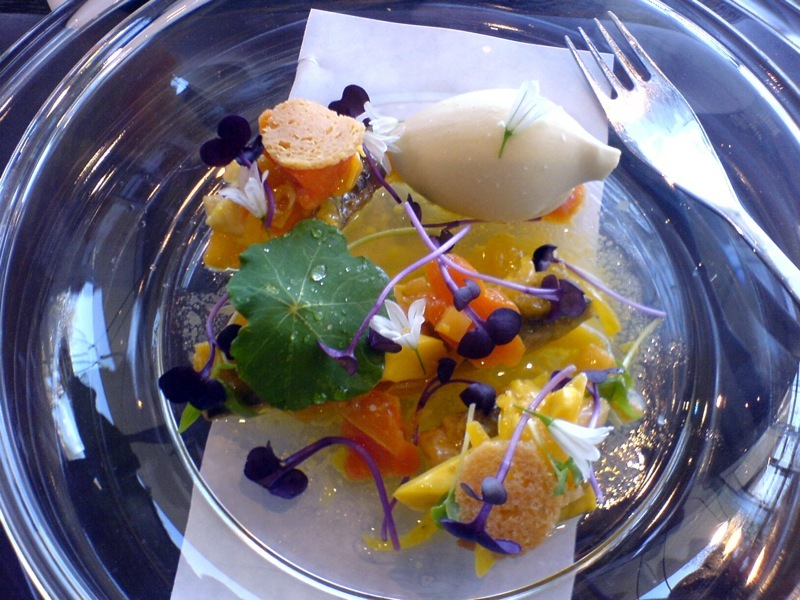 It's surrounded by varying sizes of mango air resembling eggyolks and cubes of cucumber and cucumber jelly - micro basil garnishes. 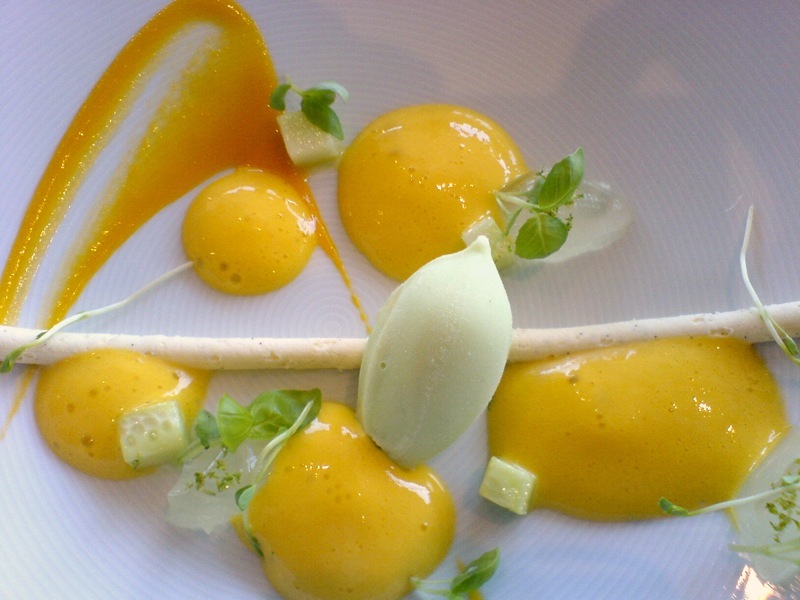 A pale green quenelle of cucumber sorbet rests across the mousse, a smear of mango puree for highlight.